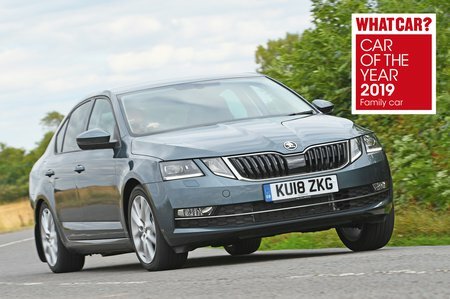 Skoda Octavia 2.0 TDI CR SE L 5dr 2019 Review | What Car? What Car? will save you at least £2,009, but our approved dealers could save you even more. The Octavia confirms its place as a class-leading hatchback purely by the amount of space on offer, with a boot that’s longer and far more useable than almost any of its rivals. It’s also incredibly well priced for a car with such substance and gets plenty of equipment regardless of which trim you choose. For a practical, useable and enjoyable hatchback, it’s hard to beat the Octavia. SE L trim brings Alcantara and leather seat trim, LED headlights, power-folding door mirrors, privacy glass and automatic emergency braking. A nice added extra is the handy umbrella kept under the passenger’s seat. Worth the extra if you want good fuel economy but also strong performance. It’s also more refined than the 1.6 diesel, emitting fewer vibrations at low revs and benefiting from a six-speed manual gearbox as standard.